Whether due to injury, disability, or age, more and more homeowners today in need of assisted living are reaching out to home professionals for solutions that enable them to stay independent and in their home rather than having to move in with a family member or to a care facility. Because of this, accessible design is becoming a popular topic among interior designers, architects, builders and other home professionals as they look for ways to better marry together beauty and function in a home. Technology can offer remarkable independence and security without compromising the aesthetics of the space, which is why many accessibility-conscious designers now incorporate home automation into most of their designs. When Joe Ribera began working as an Instructional Designer and Technical Trainer at Control4, he too could quickly see how Control4 whole-home technology would be able to make any home more accessible. The first person who came to his mind specifically was his Aunt Sally, who has been living with a muscular degenerative disease for almost three decades. After talking about this opportunity with her, he got to work adding technology into her home to give her more independence and make daily living easier. The results have been truly liberating for Sally. We took a few moments of Joe’s time to ask him about what he’s done to make her home more accessible, how it’s improved her life, and what his next projects are for the home. I was a public middle school educator for seven years before I earned a master’s degree in educational technology. I then switched careers and took a job at a company where I developed online training content for school educators. About a year and a half ago, a former coworker of mine nudged me to apply for a position at Control4 within the Education Department. I jumped on the opportunity, and it has been a great fit because of my love of instructing, developing online learning, and tech toys. Tell us about your aunt and her muscular degenerative disease. Sally has been living with this disease for 28 years, but when the effects began to limit her travels and movement, it became more evident to the family that there was very little we could do to help. She currently is limited to being able to move her right arm and part of her left arm. She spends most of her day either in bed or in a motorized wheelchair. She has a caregiver company that has someone come and help her get ready for the day, prepare food, and provide other help for her in the mornings and evenings. The really difficult thing to watch is that she is mentally fit as a fiddle; she has multiple degrees in education and a memory like a steel trap. She can speak and communicate just fine and is very witty, so it was hard to watch her become more and more limited physically and the frustrations that caused emotionally. How has home automation technology assisted her in daily living? 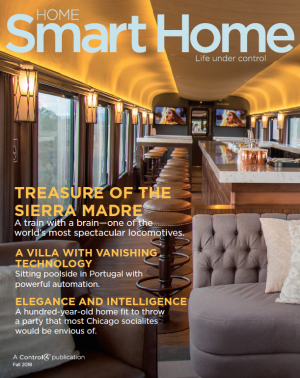 Once I began to learn more about Control4 and what we are able to do when retrofitting a home, it became clear to me that there were some great things a Control4 Smart Home system could do to help Sally with her day-to-day activities. You see, Control4 can hook into existing homes (retrofit) and devices, which makes a project like this a lot easier. The Amazon Alexa integration with Control4 was the tipping point, though. After Control4 was able to easily incorporate Alexa into a project and control multiple devices through voice activation, Sally was sold. She knows that her disease is irreversible and will only continue to limit her muscle movement; she will eventually only be able to use voice as a way of command and interaction. Control4 and Amazon Alexa are giving her independence and choice often not available to someone in her physical state. What technology did you put in her home to make it more accessible/livable for her? I knew this would be different from other projects I have helped with because of her unique needs. In her two-story townhome, she spends half of the day upstairs in her bed, and half downstairs in her wheelchair. I surveyed her home and interviewed her about her day-to-day routines in order to find things that could be automated. Then I began where every home automation project should begin: installing a solid network. I replaced her existing DSL internet access point with a Pakedge WR-1 (wireless router and switch in one). Everything needed to be done with the expectation of only having voice activation for control. I knew we would need a way to control the televisions—one upstairs and one downstairs—and so I added an EA-1 to both that would hook into the cable box so she could use her voice to operate. Sally has multiple lamps and lighting downstairs, so I needed a way for her to easily control her lights. I added four outlet modules and wireless switches and dimmers. This has given a lot more control back to her, which she has been without for a few years now. Because of her condition, she has massive muscle loss, therefore she is often cold, so temperature control was a must have. I installed a Control4 thermostat, and now she can easily adjust the temperature with just her voice wherever she is in the house. One really cool integration we added was a Z2IO to the project to control the relay on her automated sliding door. She used to have to push a button to trigger the door—which would have slowly become more and more difficult for her to do—but now she can also control it through voice, making going inside and outside easier. Those are just a few of the home automation integrations we’ve added to make her life easier and give her more freedom and independence in her home. We also installed an outside Z-Wave outlet where her backyard fountain plugs in. This gives her the ability to control the fountain from inside by voice command. A couple of fears that Sally had before is about there being a fire and/or a power outage. We had a licensed electrician install multiple battery backups, and then we connected them to the Control4 system so that way she will always be able to communicate with the outside for help if she ever needs it and/or be able to get herself out of the home. This has given her more confidence and security in living alone and staying independent. What has her experience been like with Control4 since you’ve installed it in her home? Sally absolutely loves what we have done for her so far. She really values being able to monitor and control the thermostat by voice command. Sally’s sister often comes over to visit and needs to turn on a tower fan because Sally keeps her home so warm. I have added control to a tower fan so that when Sally’s sister leaves, Sally can turn off the fan by voice. She also enjoys the voice control with her televisions and being able to change channels and adjust volume using just her voice. When Sally comes downstairs in the morning, she has a lighting scene called “Good Morning.” So she will say, “Alexa, good morning,” and Alexa will respond with, “Good morning, Sally” and Control4 turns on all the different lights downstairs that she often uses during the day. There is another one for the evening where Alexa will respond to a “Good Night” command by saying, “Good night Sally, sleep tight,” and turn off all the lights,televisions, and other integrated devices in the home. Sally also has many seasonal decorations—lighting for Christmas and Halloween—that I have incorporated into the Control4 system and can now be controlled with voice commands. For example, I plugged her Christmas tree lights into the system and programmed them to be controlled individually by her saying a simple command and then Alexa will respond, “Merry Christmas, Sally” as the lights turn on. She loves having a personal touch and conversation-like commands with Alexa. What are you doing next for her home? We are in the process of completing the install of a couple of wireless dimmers for her kitchen. We also have plans to install automated blinds/window coverings for her front windows. There are also plans to add an automatic front door opener and add an integrated door lock, as well. That’s the great thing about a Control4 system—you can gradually build more and more technology into the platform over time and it will all integrate together. Down the road, I would like to add a device that will work with Amazon to add all of her contact phone numbers so that she can easily call anyone she needs to with just a voice command. I have also thought about adding a few motion sensors and cameras so that Sally can be informed when someone is at the door and view the footage from Control4 touch screens in her home. Creating an accessible home for my aunt has been a very informative, challenging, and rewarding project. Seeing how much joy it has brought to Sally and the freedom it has brought back into her life has made it all worth it. Accessibility issues in the home can happen to anyone at anytime, whether it is through an accident, disease, or just age, and this project has made me realize how valuable smart home technology is in any and every home.